Where Can I Find a Mercedes-Benz Dealer Near Me? Locating one of the best Mercedes-Benz dealerships near you in the Los Angeles area is simple and easy. Mercedes-Benz of Beverly Hills offers reliable vehicle sales, auto financing, certified Mercedes-Benz service, genuine parts and more. Whether near or far, we are confident that our luxury car dealer will be worth the short drive. Mercedes-Benz of Beverly Hills is just a short half hour drive away from Los Angeles. Mercedes-Benz of Beverly Hills is just a short 15 minutes drive away from Westwood Los Angeles. Mercedes-Benz of Beverly Hills is just a short 15 minutes drive away from Culver City. Mercedes-Benz of Beverly Hills is just a short 15 minutes drive away from Miracle Mile Los Angeles. Mercedes-Benz of Beverly Hills is just a short 10 minutes drive away from West Hollywood. Mercedes-Benz of Beverly Hills is just a short 10 minutes drive away from Century City. Mercedes-Benz of Beverly Hills is proud to be the Mercedes-Benz dealer near me in the Los Angeles area. Contact us today for exceptional offers on new and used Mercedes-Benz luxury cars and SUVs near me, as well as Mercedes-Benz service, repair, maintenance, parts & more. Plus, don’t forget to ask about our Mercedes-Benz financing, lease offers & special offers. Mercedes-Benz of Beverly Hills is your source for great offers on new & used Mercedes-Benz luxury cars and SUVs for sale near me in the Los Angeles, CA area. Whether you prefer the C-Class, GLE, CLA, or one of our other popular models, you’re sure to find a great selection. Our Mercedes-Benz inventory includes new, used and Mercedes-Benz certified pre-owned models. Call to schedule a test drive at our convenient Beverly Hills location, near the intersection of Santa Monica Blvd & Beverly Blvd. Finding reliable Mercedes-Benz luxury car oil changes, battery replacements, and scheduled service doesn’t have to be difficult. Mercedes-Benz of Beverly Hills’s service department employs only Mercedes-Benz certified mechanics and technicians in our Los Angeles area service center. Drop in anytime. For added convenience, we encourage our customers to call ahead or schedule online. Trying to Find Mercedes-Benz Financing & Lease Offers Nearby? 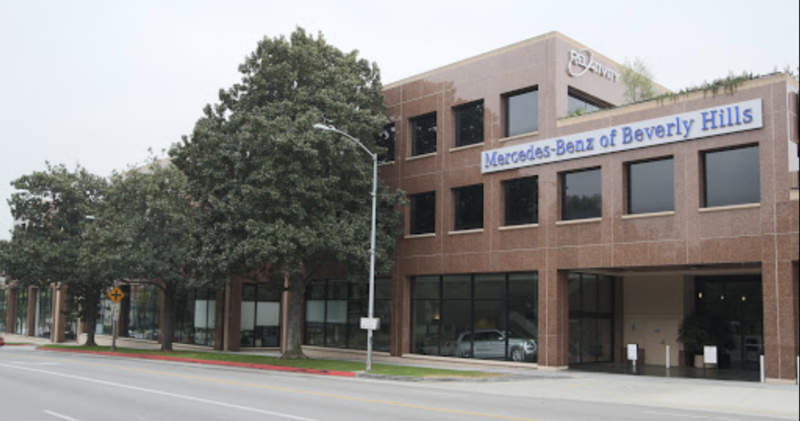 Have you been to Mercedes-Benz of Beverly Hills’s leasing or financing department? If not, you’re probably missing out on some of the best Mercedes-Benz lease and finance offers available in your area. Contact the Mercedes-Benz of Beverly Hills finance department today and find the offer you’re looking for. Whether you’re looking for Mercedes-Benz sales, service or finance, stop by our nearby dealership today. We are located at 9250 Beverly Blvd, Beverly Hills, CA 90210, near the intersection of Santa Monica Blvd & Beverly Blvd. Make an appointment online or call today. I had a great experience with Jose Ramos. He is very knowledgeable and professional to work with. I took my vehicle for a recall service and from the minute I drove through the service drive I felt appreciated as a customer. Service advisor ( Andreas ) kept me up to date and vehicle was done and ready when promised. Thanks to everyone for getting my vehicle serviced.